It’s happening in bits and pieces lately. Our front porch pumpkins are dwindling as they keep being attacked and opened by squirrels for the seeds. Talks of holiday budgeting and where to pare down to keep the stress levels low and joyfulness high. Ideas about celebrations. 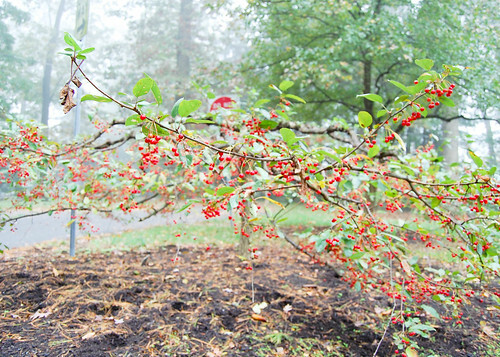 Noticing the little red berries that are slowly becoming the brightest colors outside. 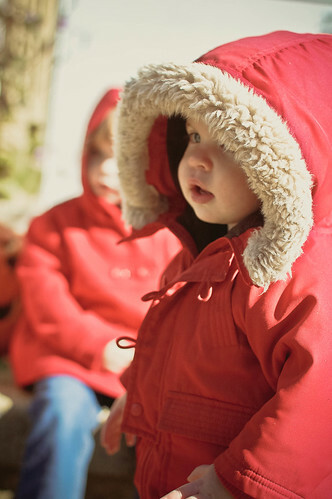 Planning for what to get for little ones…lots of low rumbling about the holidays. I can’t lie, I’m definitely excited. The parts leading up to the holidays are my favorite. So, when I opened my order in the mail this week that contained The Farm Chicks new book, The Farm Chicks Christmas, I could barely contain my excitement! So, it’s with so much joy and excitement, that I decided to join in The Farm Chicks Virtual Book Signing Party and share with you today a few plans in the works for the holidays around here. I’ve been bookmarking and saving links for entirely too long, so today is the day that I’m getting it all organized and putting some concrete plans into action! I went back and re-read this post from last year about our holiday traditions as a family. It was sparked by Meg at Sew Liberated’sHoliday Traditions Exchange, but became so much more meaningful as I began to delve into thinking about what I really want the holidays to mean for us as a family. I’m loving continuing those thoughts again this year and planning to add some new things! I loved this post last week at Progressive Pioneer. I’m not going to lie and say that I think we’re going to come in at under $100 for all of Christmas this year, but I love the general spirit of really looking at what you’re spending money on and how it’s adding value and joy to your holidays as a whole. There are so many meaningful ways to enrich our experiences and she has some great suggestions for traditions that are meaningful and thoughtful. I couldn’t decide whether to categorize this link under Crafting or Traditions. To me, while it’s about having a Handmade Holiday, it’s really about making a conscious choice to choose meaningful things that include a lot of love and incorporating that sentiment into holiday traditions. Part of the choices that we make as a family include not wanting to buy so many things for reasons beyond simply saving money. We just.don’t.need.it.all. The added impact of perpetuating that cycle of teaching my children to associate the holidays with buying buying buying is exactly the direction that we do not want to go. In the end, though, I decided to include the link under Crafts – obviously;) Because if you also want to try to make some handmade gifts and/or simply try to spend money with small business making handmade items, the resources are endless. She has so many beautiful ideas! These little elves are the cutest things ever! And my sweet girl is in love with anything that she can carry around in her pocket, so these little guys might very well become a fun holiday tradition around here. Especially since I have been scouring used book stores and online to find a copy of this book. We haven’t read it yet and I can’t wait to add it to our basket of Christmas books that we started last year. Our list of things to make the kids has been growing through the year. Every so often I see a project that I know that would love and I send it to my husband at work and say, “You could make this by Christmas, right? ?” But we can’t do it all. We wanted to make them play stands, but I have a total of 3 Saturdays and 4 Sundays that I’m not working between now and Christmas and most of those days wind up being dedicated to much-needed family togetherness time. So, we’re going to keep it simple. I’m going to do some of the same projects I did last year – more playsilks and more of the little peg people. I still have quite a few of our sweet wooden people left from last year. I thought we’d make more, but they’ve been sitting. So, I think I’m going to use them and make a nativity set. She’s already loving and asking about The Christmas Story, so a nativity scene for her to play might be a great visual. John is going to get working on making them a set of blocks because it’s still a mystery to me that they don’t have a good set. I’m taking this holiday photography class and I cannot wait! Another fun holiday photography bit – this fantastic Holiday Bokeh Tutorial by Robert Donovan. So that’s where we are. Among the chilly, wet days – planning. Thinking. Excitement. Contemplation and intentions set for a holiday season. And lots of gratefulness in this month of giving thanks. Lots and lots of gratefulness. If you think you might want to order a copy of The Farm Chicks Christmas, head over to the site today! To celebrate the Virtual Book Signing Party, all orders placed on the site today, November 5, before 1pm PST will be signed by Serena and several of her friends featured in the book! I am looking forward to absorbing the pages of this book, and visiting all of the participating blogs has added to my holiday anticipation. Thank you for sharing links… more fun to savor.